Between 1914 and 1923 industrial and agricultural production in Russia was devastated by the effects of war and civil war. Only after the introduction of Lenin's New Economic Policy in 1921 did some modest revival begin - but from a very low base. So though Soviet authorities might have liked to create a completely new image for their postal services, for the most part they had to make do with what they inherited. They had to improvise and they had to recycle - and, in fact, were quite good at it. These letters of 1922 and 1923 were sent from Bershad and Snitkov in Podolia / Podillia, Ukraine to Dr Brender's Aid Committee in Berlin. On both, the old Imperial cancellers continue to be used. And because supplies of international R labels had run out, the post offices found something else to take their place. In this case, both offices are using labels which would have been used on Imperial period Bulletins d'Expedition accompanying parcels going abroad. So they give the town names in Roman. And conveniently they have a space for numbering. 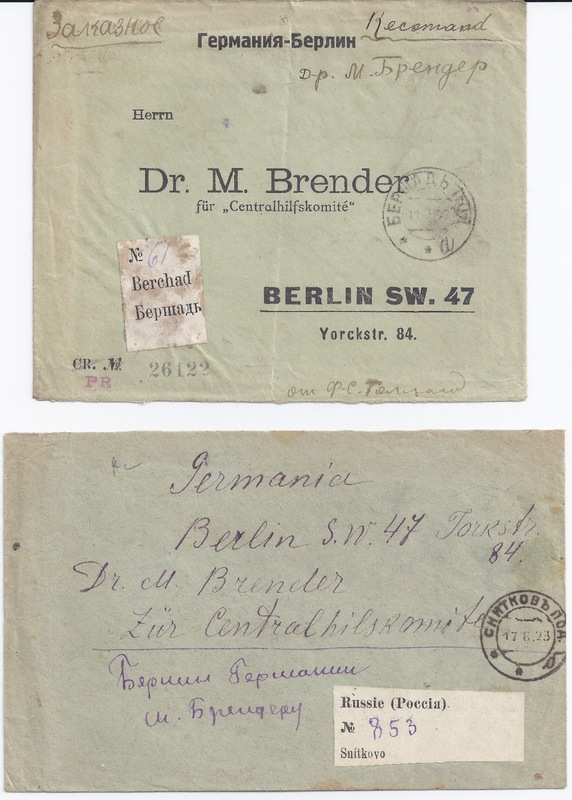 You can be pretty sure that very few parcels were going abroad at this time - the parcels were coming the other way in response to letters (like these) requesting assistance. Problem solved. A nice collection can be made of the various ways in which between 1917 and the mid 1920s (or even later), improvised solutions were found to problems at the post office counter. Of course, the principal improvisation was the continued use of Imperial stamps, which lasted until 1923. Imperial cancellations also continued in use and for longer - until 1925 or even later. This makes the pace of Sovietisation slower than the pace of Nationalisation in newly independent countries like Finland or Latvia which had emerged from the break-up of Imperial Russia and which replaced stamps, cancellers and labels much faster than did Russia. In response to Dr Ivo's Comments, I now illustrate examples of two more types of Provisional label. 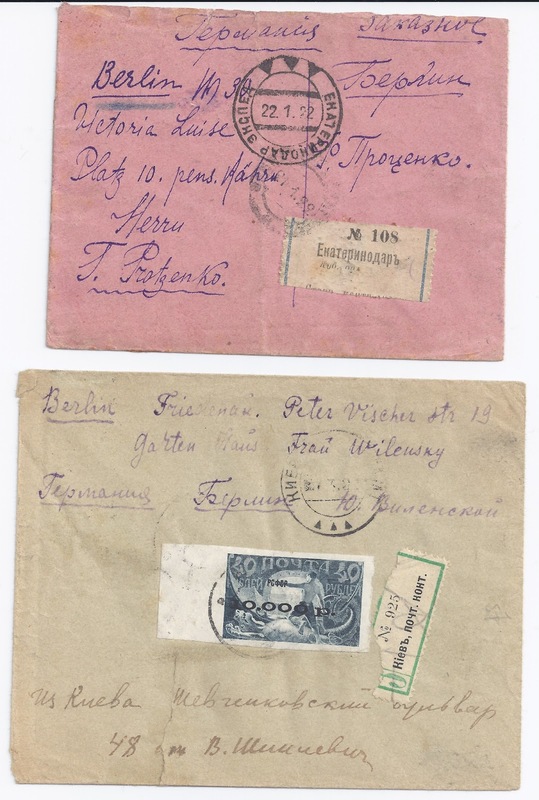 On the January 1922 letter from Ekaterinodar to Berlin, the Registration label is improvised from a type of label used on Imperial period Inland Money Transfer Forms and Parcel Cards - so it is in Cyrillic rather than Roman type. Note also the EKATERINODAR EXSPED 22 1 22 three triangle censor mark - newly manufactured. The Imperial period Ekaterinodar cancel is directly below it and in poor condition. I also show a March 1922 cover from Kiev to Berlin. 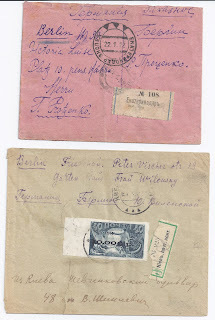 Here the Registration label is improvised from a type of label used on Imperial Inland Cash on Delivery letters, so again it is in Cyrillic even though the letter is going abroad. Once again, there is a Three Triangle censor (this one KIEV ...). Wonderful stuff. I was familiar with the other two forms of improvised R-labels (green COD labels and blue-lined labels from parcel address cards, the latter particularly popular in Transcaucasia) but this is a new one for me!